After the revelry of Carnival celebrations, comes the sober time of Lent. Lent is the period between Ash Wednesday and Easter. The word for Lent in Spanish is Cuaresma, which comes from the word cuarenta, meaning forty, because Lent lasts for forty days (plus six Sundays which are not counted). For Christians, this is traditionally a time of sobriety and abstinence meant to correspond to the time Jesus spent in the wilderness. Many people decide to give up something that they enjoy for Lent such as sweets or alcohol. In Mexico, it is customary to abstain from eating meat on Fridays during Lent. Read more about Mexican Food for Lent from the blog Mexico Cooks! The first day of Lent is Ash Wednesday. On this day, the faithful go to church for mass and at the end of the service, people line up to have the priest draw the sign of the cross in ashes on their forehead. This is a sign of repentance and is meant to remind people of their mortality. In Mexico, many Catholics leave the ashes on their foreheads all day long as a sign of humility. In some regions of Mexico, there are special celebrations that take place each Friday during Lent. For example, in Oaxaca, the fourth Friday of Lent is the Día de la Samaritana, the fifth Friday of Lent is celebrated in nearby Etla at the Señor de las Peñas Church. 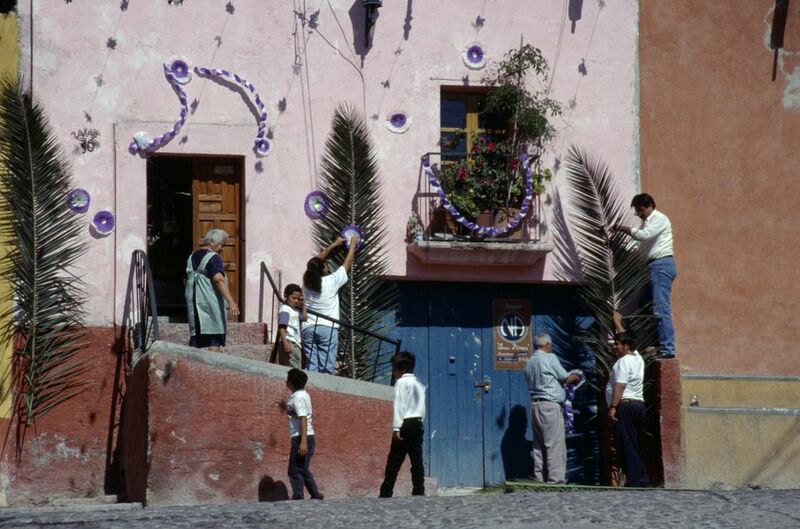 The custom is similar in Taxco, where there is a celebration on each of the Fridays during Lent in a different nearby village. The sixth and final Friday of Lent, the Friday before Palm Sunday, is known as Viernes de Dolores, "Friday of Sorrows." This is a day of devotion to the manifestation of the Virgin Mary at the foot of the cross, known as Our Lady of Sorrows. Altars are set up in churches, businesses and private homes in honor of the Virgin of Sorrows, with particular attention to her pain and suffering at the loss of her son. These altars will contain certain specific elements such as glasses of water that represent the tears of the Virgin, citrus fruit to represent the bitterness of her pain, and ceramic animals covered in chia sprouts ("chia pets") because the sprouts represent new life and resurrection. Palm Sunday, known in Mexico as Domingo de Ramos is one week before Easter and is the official start of Holy Week. On this day, Jesus' entrance into Jerusalem, when he was given a hero's welcome, and people spread palms before him, is commemorated. Artisans set up stalls outside of churches to sell intricately woven palms in the shape of crosses and other designs. In some places, there are processions recreating Jesus' arrival in Jerusalem. Read about the traditions surrounding Holy Week and Easter in Mexico.